4 November 2014. Bioengineers at Kansas State University received a patent for their invention of a peptide, a protein-like compound, that turns into water-based gels for a number of medical applications. 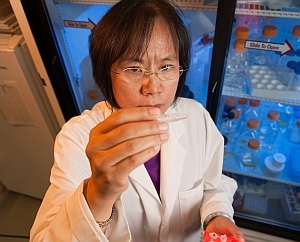 U.S. Patent and Trademark Office awarded patent number 8,835,395 to Xiuzhi (Susan) Sun, professor of grain science and bioengineering at Kansas State, as well as 2012 doctoral recipient Hongzhou Huang, on 16 September. The inventors founded PepGel LLC, a company in Manhattan, Kansas (also home of Kansas State) that licensed the research from the university. PepGel aims to commercialize the technology, producing hydrogels for building matrices used in tissue engineering and regenerative medicine. Sun is the company’s board chair and chief technologist, while Huang directs PepGel’s research and development work. Peptides are chains of 2 or more amino acids linked together in short chains, but smaller than more complex proteins. Sun and Huang designed a peptide with 19 amino acids and the ability to self-assemble into three-dimensional nanofiber networks. This self-assembly property can be enhanced to form hydrogels, by changing the pH level (base to acid) of the peptide or adding an ion, such as calcium to the compound. Hydrogels are networks of material that contain primarily water, but maintain enough substance to form into 3-D gelatinous structures. The body naturally forms some materials, such as vitreous humor in the eyes and cartilage, containing protein hydrogels. “This hydrogel system has large variations and flexibility in controlling the gel stiffness, viscoelastic behavior, and surface properties,” says Sun in a university statement. The peptides developed by Sun and Huang also contain both water-seeking and water-resistant segments that give their hydrogels the ability to transform into a liquid state, then back into a gel. In addition, the size of the nanofibers and pores in the hydrogel are similar to extracellular matrices found in nature that give structural support to surrounding cells. This similarity to natural matrices offers opportunities to apply Sun and Huang’s hydrogels to repair or regeneration of human tissue. Because of their wide range of properties, the hydrogels covered by the patent can be used for a range of biomedical applications in addition to tissue repair. Sun is collaborating in research on applying hydrogels to cancer drug delivery, stem cell cultures, wound healing, drug encapsulation, and vaccine adjuvants.